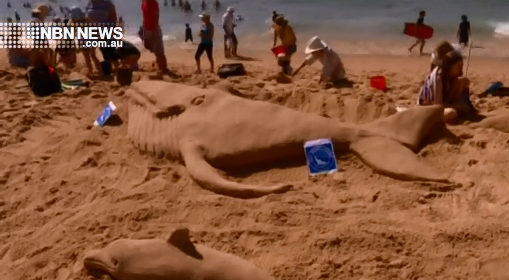 Renowned artist Dennis Massoud drew a crowd at Bar Beach today, decorating the coast with his famous sandcastles. It was all about starting a conversation on seismic testing off the coast of Newcastle and the Central Coast. “When you have something as loud and as powerful as a seismic blast it disorientates the dolphin and the whale and it can result in their death quite often,” said Mr. Massoud. “When two thirds of our gas is shipped overseas, to subject our marine animals to this harm from underwater air gun blasting for the sake of fossil fuels is to us, unconscionable,” said Dr. Natasha Deen. A decision is expected to be announced soon on where the second round of exploration will be undertaken. A documentary screening on the effects of seismic testing will be shown at Carrington Bowling Club on Monday night.